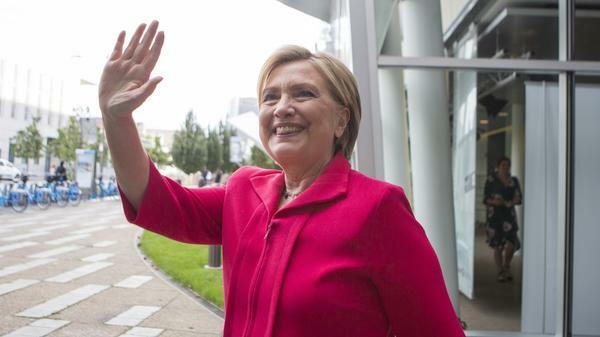 Hillary Clinton outside the Fresh Air studio in Philadelphia on Sept. 14. Hillary Clinton says she would not rule out questioning the legitimacy of the 2016 election if new information surfaces that the Russians interfered even more deeply than currently known. In an interview with Fresh Air's Terry Gross about her new memoir, What Happened, Clinton acknowledges that such a challenge would be unprecedented and that "I just don't think we have a mechanism" for it. Russia is only one aspect of the tumultuous campaign that Clinton reflects on in What Happened, 10 months after losing her bid for the presidency. She also discusses her experiences as the first woman running for president as a part of a major political party and her view on the direction that the country is headed. "I am fundamentally optimistic about our country, but I am not naive, and I don't think we can change things unless we take it seriously," Clinton says. What follows is the transcript of the conversation between Clinton and Gross, which was recorded at WHYY's studio in Philadelphia. Terry Gross: Hillary Clinton, welcome to Fresh Air, and thank you for being here in our studio. It is a pleasure to have you here. Hillary Clinton: Thank you so much, Terry; I am delighted to be here. So I want to pick up where we left off [during Clinton's 2014 Fresh Air interview] — and this isn't going in the direction that you think it is, so bear with me. So the last time we talked, an excerpt of our interview went viral, and we'd spent a few minutes earlier on the air talking about as secretary of state you were a strong LGBTQ rights advocate, saying, "Gay rights are human rights. Human rights are gay rights." And after that I asked you about whether there were gay-related positions, LGBTQ-related positions, such as marriage equality, that were more difficult to support when you were a senator, because you thought the public, the voters, weren't ready yet. So this went viral, and the takeaways and the press seemed to be that you were evasive, and in some parts of the press, that you weren't quick enough to endorse marriage equality. I wanted to tell you my takeaway. My questions were a little unclear and unfocused. I think you were a little evasive, but here's my real takeaway: Although a lot of people, including myself, might've assumed that this went viral because of gay-rights activists pushing it out, it was the opposite. It actually went viral because of a right-wing website called America Rising. They had it up before we even had it up on our website, and America Rising's goal was to take quotes from the mainstream press and use them against you. So the excerpt of our interview was taken out of context; it no longer had the context of you being a forceful LGBTQ advocate as secretary of state, and really you were definitely going to be stronger on LGBTQ rights than anyone America Rising would likely support for president. So here was the right trying to turn your base against you, the right attacking you from the left. So my question to you is, did you know that America Rising was behind pushing it out and helping it go viral? I didn't know specifically who it was, Terry, but I've had now so much experience in both watching and being the object of a lot of right-wing attacks, and they've gotten increasingly sophisticated. So many times you don't know where they're coming from, and as I write in my book, they are now aided and abetted by Russia and by other groups that are part of this right-wing ecosystem and echo chamber. So I would not be surprised to hear that about anything that I've said, because in the campaign we've just finished, the amount of right-wing attacks of foreign interference and influence has just exploded. So what used to be kind of a cottage industry by the right is now much more sophisticated, pervasive and in alliance with one of our foreign adversaries. Let's get to the present. Losing is always hard. Did it make it especially hard knowing that the person you lost to, who is now our president, is somebody you've described as "a con man with no experience to be president and not the right temperament to be president"? It did make it a lot more painful. I have said, "Look, if I lost to another Republican I would be disappointed. I would not agree with a lot of their approach toward economics and other important issues, but I wouldn't fear for my country." I believe that Donald Trump poses a clear and present danger to our democracy, to our institutions, to the rule of law, to the civil rights and human rights of so many Americans, to the economic distribution of wealth — which is already skewed out of proportion to where it should be. I tried to say that during the campaign, and I tried to warn people, because I actually believed him. I believed that he would follow through. There were lots who said, "Oh, he never will! He's not going to do all those things he said about building a wall and immigrants and the like." And I thought he was getting so indebted to a minority in our country, but a vocal, very determined minority, that was going to try to hold him to his campaign promises — and nothing I've seen in the last months, ever since he took office, has made me feel much better. So you were the first woman to be nominated for president by a major American party. And you've said that there are things you felt you couldn't say because you couldn't afford to sound like an angry woman. What's an example of one of those things you would've liked to say, but you didn't want to sound like an angry woman? Well, I have an example in the book from the second debate, where I was feeling really uneasy, uncomfortable, because of the way he was lurking behind me, leering at me, staring at me. I knew that because of what had happened with the Access Hollywood tape he was going to try to change the subject and I knew that he was going to try to get into my head, and knock me off my game. And so I had practiced keeping my composure, and I did. But in the book, as I describe this, I say, "What if I had turned around and said, 'You know, you love to intimidate women, you're not going to intimidate me! Back up, you creep!' " Right? Well, say you'd said that. What would've happened, you think? I think it would have delighted my supporters. It would've enraged his supporters. And it would have been troubling to a lot of people still trying to make up their mind one way or the other, because anger from a woman, at least up until now, is seen as off-putting and somewhat frightening to people. And I knew that; I'd studied all the research. I had lived my life. I was well aware of it. So in the end I didn't say anything. I kept my composure, got through the debate, most everybody said I won it, which is fine, but there were other opportunities that I might have taken to try to more clearly point out the sexism and the misogyny of this man I was running against, because clearly he was Exhibit A of the remaining problems we have in making sure that women are not treated unfairly and with disrespect. Can I play you what I think is one of the more unusual things that Donald Trump said during the campaign? I'd love to hear your take on this. So this was in December, and I forget which debate it was after, he was at a rally. And he was talking about you showing up late to the debate after a break, that you were late to the podium after a break during the debate, and I want to play you what he said about that. TRUMP: I'm watching the debate and she disappeared. Where did she go? Where did she go? I thought she quit! I thought she gave up. Where did she go? Where did Hillary go? They had to start the debate without her. Phase two: I know where she went. It's disgusting. I don't want to talk about it! It's too disgusting. Don't say it, it's disgusting. Let's not — we want to be very, very straight up. Wasn't that a weird deal? We're ready to start, they were looking. They gave her benefit of the doubt. OK, so that was Donald Trump last December. Hillary Clinton, what did you make of what he was saying? I interpret that as meaning you went to the ladies' room and that's disgusting. Is that just me, or is that how you interpret it? That's exactly how I interpreted it, Terry. I did go to the ladies' room, and the ladies' room, as I remember, was much further than the men's room, and so it took me longer to get there, and as every woman listening to this interview knows, it took me longer once I was inside and then it took me longer to get back. And I thought it was a little strange that the TV station carrying the debate went ahead and started. They knew where I went. I mean, they have all these people backstage. They knew how far it was, because, actually, my advance people had said, "It's going to take her longer if she has to go to the restroom, to get there and back." That is what people do on breaks. That is what people do! You go to the restroom if you need to, and I needed to. So look, it was a little surprising to me that they actually started the broadcast again before I got back. They could've done a million different things to give me a few more extra seconds. I got back. And it's like the age-old story that you go to a stadium or some other big public place and they claim, "We've got the same number of restrooms for men and women" — but of course it takes us a little longer. So, when I heard him say that, it was in the same frame that he said those horrible things to Megyn Kelly, that he has insulted women his entire life. We have records of it going back decades. But what did it mean to you that Donald Trump thought that the idea of you using the ladies' room was "disgusting," something that he couldn't even think about, absolutely disgusting. What did that say to you? It said to me that this is a very emotionally strange man. That that would even, No. 1, cross his mind, and No. 2, that he would share it at a rally, that he thought it would endear him or motivate the supporters he had at a rally. Look, I don't pretend to be a psychiatrist and to try to figure out what goes on in his head, but if you, and you're right to point this out, if you just give it a few moments' thought, really, what was that about? He sexualizes women. He objectifies women. He's more than happy to comment on what women look like and whether they're too thin or too fat or whatever his particular obsession might be. But what about women who use restrooms? (Which is all of us.) What about women who give birth? (Which is many of us?) What about women who have all kinds of physical parts of their life? It said to me, "No, I can't be bothered. I can't even think about that. I want to see you in a low-cut dress. I want to see you in a bathing suit. I want to see whether you fit my standards." And I thought it was incredibly weird. During the campaign you heard a lot of "Lock her up! Lock her up!" Your reaction the first time you heard people chanting that — when was it, and what do you remember about it? The first time I'm actually aware of hearing it was at the Republican convention. I think it went on before that. I didn't pay a lot of attention to it. I thought, "OK, fine. He is whipping up his crowds. He is throwing them red meat, and I'm Exhibit A of that." But when they brought it inside to their convention, so that it became, in effect, part of the historic record of the general election, I was stunned. I thought, "What are they talking about and why are they saying this?" It was, to me, really not only wrong — because obviously there was no basis for it — but it was politics at a very high level being affected by the most dangerous partisan hyperbole. This is a question I should probably ask the Secret Service, but I'll ask you. You're the one on the microphone. What implications did all those chants of "lock her up" have for your security, your personal security? It was a constant challenge for the Secret Service and for what they call "threat assessment." It was something that I was aware of. I had a few times people jumping over ropes and rushing the stage and a few really nasty, threatening things said in a crowd. But what really was unhinged were the online attacks. And they weren't just directed at me, they were directed at anyone — particularly women — who went online and said they were supporting me. If they identified themselves as a supporter of mine, they were attacked from both the left and the right. They were often subjected to the most vile Twitter responses, YouTube comments you can imagine. It was just so horrific to see the horrible things being said and the threats that were being made, physical threats, to my supporters. I want to ask you about some of the longtime anti-Clinton people who were affiliated with the Trump campaign. I read Joshua Green's book [Devil's Bargain] about Steve Bannon, and he writes [that] Bannon, Kellyanne Conway and David Bossie were a team of professional anti-Clinton operatives. They had been plotting to tear [you] apart for 25 years. They were all on Trump's team. David Bossie, who was the deputy campaign manager for Trump's campaign, he founded Citizens United, which produced the film Hillary: The Movie, which led to the Citizens United Supreme Court decision that eliminated corporate spending restrictions. And you ran in one of those elections that was so profoundly affected by Citizens United. Yes, it was the first time. Yes. Then Kellyanne Conway — she had been, like, an anti-Bill Clinton pundit when he was president. Her husband helped impeach your husband by drafting the Supreme Court brief when Paula Jones sued your husband. Steve Bannon was, of course, the head of Breitbart News, and it was his idea to get Peter Schweizer to write the book Clinton Cash, which stoked the controversy over the Clinton Foundation, and that was funded by the Mercer family. So were you expecting that if you ran for president, that the longtime anti-Clinton operatives would be part of your opposing campaign? Well, I knew that they would be out there. Whether they were actually in a campaign — which originally they were not; they were backing other candidates besides Trump — I knew that they would still be coming after me. And Terry, I have to say that the Republicans have been afraid of my husband and me for many years, and I think part of it is we don't go away, we don't give up, because we understand what's at stake. They fear us in large measure because my husband was a master politician who came out of the South, who understood and had been fighting against a lot of the same bigotry, bias, prejudice, paranoia that has been at work in American politics. When he was a governor he took on the NRA. He took on race. He stood up against a lot of these forces, and then he did so again when he was president. Bill and I are under no illusions about what we are up against. I sometimes believe that too many other politicians think the game is on the level. You know, you mentioned Citizens United: This was an effort against me which led — because there's a Republican majority in the Supreme Court — to the worst decision: opening up the floodgates for not only unlimited money but undisclosed money. And I was the first presidential candidate on the Democratic side who had to run in that environment. So I view it as a perverse compliment from these really dedicated right-wingers, because they know that I know what they're really up to. They want a constitutional convention to rewrite America's Constitution to better favor business, to favor religious beliefs, to tear down the wall between church and state. OK, but in terms of all the anti-Clinton operatives who ended up being part of the Trump campaign, that's what I think some Democrats were afraid of when they said the Clintons have too much baggage, we don't want Hillary to run because she brings too much baggage with her —that's part of the baggage they're talking about. Well, but that's all retroactive, because before I announced, 82 percent of Democrats said they wanted to see me run, and a very, very large proportion wanted to support me. And part of it is because they know that I will stand up and fight back. I know what happened to our candidates in 2014, before I ever ran, before I announced that I would run. I was campaigning hard for Democrats in that midterm election, and I saw what the right was doing to really good people — people like Sen. Kay Hagan in North Carolina. People like our wonderful candidate Michelle Nunn in Georgia. People who didn't have a history of being lightning rods for the right, that didn't give them any favor; the right wants to defeat all Democrats, all moderate Republicans, all people who believe, as I believe, that we are in a real struggle for the future of America between these very powerful interests. It was always such a shorthanded unsatisfactory way for some on the left to say, "Oh well, it's all Wall Street." No. This is financial. This is religious. This is partisan. This is something that is very fueled by a desire on the part of big funders of the right to basically have the government do its bidding. It's not just financial. I mean, it is all the other issues — the civil rights and human rights and labor rights and everything that I was trying to defend in this past election. I want to talk with you about Russia. There was never an election like this one with Russian interference. And we continue to find out more, just about every day about what the Russians did. It was recently reported that in addition to the hacking of the DNC and John Podesta's email in addition to creating and pushing out fake news, Russia created fake affinity groups on Facebook, which tried to organize anti-immigration rallies, anti-Muslim rallies. What questions to do you have about what we don't know about what the Russians did? You know before the election? Well, I knew about it starting in late spring of 2016 going into the summer, and then we began to pick up clues. Like, for example, we later learned in September that our intelligence community, led by the director of national intelligence, Jim Clapper; the director of the CIA, John Brennan, had concluded that there was a campaign of disinformation, a cyber campaign against my campaign, against me, and it was meant to discredit me, defeat me if they could, and to help Trump. So we were picking up clues all the time. I didn't have access to all of the secret information, but there was an interesting moment in late August, early September when Harry Reid wrote a public letter to Jim Comey at the FBI, saying, "We are hearing a lot" — and we later learned it was because Harry had been briefed and he didn't reference all of the classified material — but he said, "We're hearing a lot in the press and elsewhere that there is an investigation going on of Trump and his associates and their involvement with Russia and Russia's involvement with the campaign. Would you verify that?" Comey never would. Then on Oct. 7, in the morning, Jeh Johnson at Homeland Security and Jim Clapper said, "There is a threat to our election." That was the same day that the Hollywood Access tape came out. Within one hour the Russians — through their cutouts at WikiLeaks — dropped the Podesta emails. To distract from the Access Hollywood video? They may not have known about that specific video, but something was going to happen, because Trump was a bit of a loose cannon, and they were going to intervene. Remember, go back to August, and Roger Stone, one of Trump's associates, was tweeting, Oh it's going to be John Podesta's turn in the barrel, and all of that. What do you think the press could've done? I mean, once the information is out there, it's going to be reported on. What would you have liked to see the press have done? What I would like to have seen is, "You know what? These were stolen emails ..." Every story should start with, "These were stolen emails, and the best judgment from our intelligence professionals and independent analysts is they were stolen by Russia. And they were stolen for a purpose and they are clearly meant to kind of prevent any more attention on Trump's bad behavior." And to be like shiny objects all over the place, waving in front of people, and to be weaponized — to go back to the point you were making — to be weaponized into negative stories that then could be posted on right-wing sites and be covered on Russia TV and then can migrate to Fox News and Breitbart and Facebook and everything else. That's exactly what happened. In the last month of the campaign, Trump mentioned WikiLeaks 160 times. Why? Because they were making up stuff 24/7. You told Susan Page at USA Today that you believe that the Trump campaign colluded with the Russians. What leads you to believe that? I was careful with that. I said we know they communicated. We know they tried to hide all of the communications — both phone calls and meetings. We know that they took advantage of very well-timed Russian activities. We know that they had a very clear line of communication that was set up, that, in fact, after the election, the Trump people wanted to continue — and not in the sight of our intelligence providers. We know that the intelligence community of our country — people who I've worked with, people who I have every bit of confidence in — have concluded that this came from the top of the Kremlin and was intended to help Trump. We know there were all these financial entanglements. We're learning more all the time. There's just communication, there's financial, there's a lot of breadcrumbs and trails that are now being investigated. It's up to the special counsel, the Congress to determine what the facts are, but there's just a lot of smoke there. You've basically said that you thought the Comey comments about the email investigation is what tipped the election. And ultimately caused you to lose. But you've also said the Russian bots and Facebook pages and affinity groups and the hacking all contributed to your loss. Democrats have said that they think there was Russian interference in the election, but that they're not challenging the results of the election. As more and more information comes out about the depth of Russia's interference in the election, do you think, at some point, that it would be legitimate to challenge the legitimacy of the election? I don't know if there's any legal constitutional way to do that. I think you can raise questions. In fact, I think part of the reason Trump behaves the way he behaves is that he is a walking example of projection. Whatever he's doing and whatever he thinks is happening he will accuse somebody else of. And there are examples during the campaign when he did just that, like when he called publicly on Russia to hack my personal emails. He knew they were trying to do whatever they could to discredit me with emails, so there's obviously a trail there, but I don't know that in our system we have any means of doing that, but I just wanted to add to the point you made. There's no doubt they influenced the election: We now know more about how they did that. Let me just put it this way, if I had lost the popular vote but won the Electoral College and in my first day as president the intelligence community came to me and said, "The Russians influenced the election," I would've never stood for it. Even though it might've advantaged me, I would've said, "We've got to get to the bottom of this." I would've set up an independent commission with subpoena power and everything else. I want to get back to the question, would you completely rule out questioning the legitimacy of this election if we learn that the Russian interference in the election is even deeper than we know now? You're not going to rule it out. No, I wouldn't rule it out. What would be the means to challenge it, if you thought it should be challenged? Basically I don't believe there are. There are scholars, academics, who have arguments that it would be, but I don't think they're on strong ground. But people are making those arguments. I just don't think we have a mechanism. You know, the Kenya election was just overturned and really what's interesting about that — and I hope somebody writes about it, Terry — the Kenyan election was also a project of Cambridge Analytica, the data company owned by the Mercer family that was instrumental in the Brexit vote. There's now an investigation going on in the U.K., because of the use of data and the weaponization of information. They were involved in the Trump campaign after he got the nomination, and I think that part of what happened is Mercer said to Trump, "We'll help you, but you have to take Bannon as your campaign chief. You've got to take Kellyanne Conway and these other people who are basically Mercer protégés." And so we know that there was this connection. So what happened in Kenya, which I'm only beginning to delve into, is that the Supreme Court there said there are so many really unanswered and problematic questions, we're going to throw the election out and redo it. We have no such provision in our country. And usually we don't need it. Now, I do believe we should abolish the Electoral College, because I was sitting listening to a report on the French election and the French political analyst said, "You know in our country the person with the most votes wins, unlike in yours." And I think that's an anachronism. I've said that since 2000. I want to ask you about Comey and the email investigation. Comey has said that he felt he needed publicly to say that the FBI was investigating your email server to protect the credibility of the investigation, after your husband spoke with then-head of the Justice Department Loretta Lynch, when their planes were on the tarmac together, and your husband went over to her plane and chatted with her. I have no idea what they said, but it raised the question of conflict of interest and she was overseeing the investigation into the emails. So you paid a big price for that chat — we don't know what the outcome of the investigation would've been had it not been for that chat. So in assessing what went wrong with your campaign and with the election results, how much do you trace back to Bill Clinton's conversation with Loretta Lynch, and is that something you talk to him about? You know Terry, I think it was a phony rationalization by Comey for the following reasons: Both Loretta Lynch and Bill immediately said they talked about grandchildren; there was no subject raised that had any legal significance. That's No. 1. No. 2: There's a chain of command in the Department of Justice. The deputy attorney general, Sally Yates, who I think people recognize as an incredibly experienced woman with great integrity, was next in line. So there was no reason why Comey could not have gone up the chain, which was what the protocol required. So he could've gone to Sally Yates if he thought, "OK, I don't want to put Loretta Lynch in this kind of awkward position, so she recuses herself, so I will go to Sally Yates." But I do give him credit for recognizing there was no case. Where I part company is when there is no case that is all that's supposed to be announced. He had to go and do a press conference and indict the entire State Department and how the State Department diplomats communicate, and I write about this in the book, and I try to be as dispassionate as possible. OK, so let's say, whatever his rationalization was, it ends on July 5, when he makes that, I thought, uncalled-for press conference. That's not my beef with him. We were doing fine after that. We had a great convention; I won all three debates. I was judged by every poll — public and private — as on my path to winning. Where I part company with him — and think he violated every rule in the book as an FBI director — was what he did on Oct. 28, because what he did then was to send a letter acting like he was reopening an investigation that had been closed to Congress, knowing it would be immediately leaked. And later on when asked, "Well, weren't you also conducting an investigation into the Trump campaign and their connections with Russia?" Yes. "Well, why didn't you tell the American people that?" Because it was too close to the election. I think the American people deserve to know there was an FBI investigation [into the Trump campaign's ties to Russia] that had started in early 2016 — Americans never knew that. And yet my emails, which he reinjected into the campaign at the very end, he could've handled — OK suppose he legitimately thought, again, from pressure, because remember Rudy Giuliani two days before the 28th said, "Something big is gonna happen." He [Comey] could've said, "I'm going to look at this." I would've said, "Go ahead, look at it. I have nothing to hide. It's the same stuff you've already seen." But no, he injected himself, but he never said a word about the Russia investigation. I think what some people are trying to figure out about your book and your tour, your book tour, is how much of it is about trying to defend our democracy — which you think is under attack, both by Russia but also by part of the right wing in America — and how much of it is just self-justification, like you lost, you're angry, you're specifically angry at some people, and Russia, and, like, where is the line? And I think a lot of people [are] more comfortable with the part where it feels like you're defending American democracy and less comfortable where you feel like you're just in it to justify yourself and to say, "I should've won, I did really win, and I'm really angry that I didn't." All of the mistakes that I made, my campaign made, and I'm happy to acknowledge those, because that was part of the retrospective that I had to go through to write this book. I don't think you can understand what I am most worried about in defending democracy unless you follow along with what happened. So yes, I do think sexism and misogyny played a role, and it's not just about me — I make that clear. I think voter suppression played a much bigger role than people are acknowledging. That is not going away. I think Comey cost me the election, but it was aided and abetted by Russia, WikiLeaks and all the other things we've now found out about Russia. So take me out of the equation. I'm not running again. I'm not going to be on the ballot. So take me out of the equation and say, "OK, the mistake she made, maybe we can learn from that, etc., etc. But what do we have to worry about?" I think I do a very clear job of saying here are the things we need to worry about going forward. And I also try to say, "Hey this is something that we all have a stake in." I am fundamentally optimistic about our country, but I am not naive, and I don't think we can change things unless we take it seriously. Just getting back for a second to the tarmac thing. Whether or not Comey was justified in his reaction, probably your husband shouldn't have gone onto that plane, right? You know what? I don't think either he or Loretta Lynch — they never thought about it. It never crossed their mind! They both said that. Of course they said, in retrospect, for people to blow it up and make all kinds of innuendo out of it, they would never have done it. They knew each other. Their planes were parked next to each other. They were exchanging pleasantries. I don't think my husband ever for a minute thought, "Oh my gosh, how is this going to look?" It never crossed his mind! And then obviously he and she wished it hadn't happened, because it was used to raise questions that — even if they had been legitimate — could've been handled in a different way. The thing with conflict of interest is it's about the appearance of conflict as much as it's about conflict, and that's one of the rules of journalism, the appearance of conflict is a conflict in and of itself. He [Comey] could've said, "I'm really sorry the attorney general did this, and I'll take her at her word, nothing was said, but I ask her to recuse so I can go to the deputy attorney general." And he would've been told, "You don't have a press conference when you're saying there's no case." You are the former head of the State Department. You're watching the State Department change dramatically under the Trump administration. What are you seeing that concerns you? Oh, so much, Terry. I mean, there is a misunderstanding at the most profound level about what the foreign service does, what our diplomats do, how well trained they are, the languages they speak and read, the abilities they have. They're not being utilized. They're not being respected. They are being ignored. And I think it's to the detriment of our country. Take North Korea: We have people who speak the language, who understand the history, who could be extremely helpful in trying to bring about the kind of intensive diplomatic effort that is needed with our allies. Instead we get the president tweeting out that he's going after South Korea. It makes no sense at all. I could give you many examples that are evidence of their misunderstanding and their disdain for the quality and the experience of people in the State Department. Thankfully, the Congress seems to have a better idea, because they did send a budget to slash the Department of State and USAID to the Congress, from the Trump administration, and in a bipartisan agreement they said, "No, you don't understand what we know. We've been in Congress. We see what diplomats do. We travel and meet with ambassadors and others who are working in the field." So I'm hoping that the Congress will hold the line on the Department of State and that not as much damage as I feared will actually end up happening to the institution so that it's ready to be used again in the future. I think for anybody who is retiring, so to speak, or leaving any job they've had for a long period of time, you go through a bit of an identity crisis: "Who am I now, now that I'm not doing this work?" So you and your husband are both never going to run again for office. You've said you're out of the game. So you've written this book — you're back in the spotlight again, you're back talking about politics and the election — but that's not going to last forever. The book will come out, it will be read by the people who read it, and then you're going to go on with your life. Are you undergoing a bit of an identity crisis at all, knowing that there's a big part of your life that's behind you, and you have to invent what the next part is going to be? I'm really not, and that's in large measure because I'm not going to retire from being active in politics. I've started a new group called Onward Together. We are raising money to fund a lot of these new grass-roots groups that have sprung up since the election, to recruit candidates, train them, help them. I'm not going to just go slowly and quietly into that good night, because I believe and that's — as you have said, earlier in the interview — key to why I wrote this book. I think we are at a very threatening crossroads in our country, and I have said and I will say it again, I think this administration and their allies in Congress and their allies on the outside pose a clear and present danger to our nation. So I'm not going to sit by and let that happen, if I have anything to do with it. Have you seen President Trump since he was inaugurated? I only saw him on Inauguration Day, and I write about that and what a surreal experience it was. But no communication since then? Except the way he tweets at me from time to time. Right, and do you read those tweets? Or do people tell you about them? People tell me about them, and about this book he tweeted the other night "inaccurate," and all of that stuff. So I tweeted back at him this morning — because I have a children's book that also came out at the same time, it's a children's version of It Takes A Village — so I tweeted back, "If you didn't like this book, how bout reading this one? Because it talks about how you solve problems together. So I take it kind of lightheartedly. I never know quite what he's trying to achieve other than feeding his base, which he uses his Twitter account for. Hillary Clinton, thank you so much for talking with us. Thank you. Thank you, Terry. I enjoyed it. Thank you. Sam Briger and Mooj Zadie produced and edited the audio of this interview. Bridget Bentz, Molly Seavy-Nesper and Martina Stewart adapted it for the Web. This is FRESH AIR. I'm Terry Gross. Today we have the new interview I recorded Thursday with Hillary Clinton, who's just published her memoir about the campaign and losing the election. It's called "What Happened." She writes that she couldn't bear letting down the millions of people who voted for her, but she says, I couldn't get the job done, and I'll have to live with that for the rest of my life. The last time I spoke with her was in June 2014 before she announced her candidacy. An excerpt of that interview, the excerpt about her position on marriage equality, was picked up by many news outlets. Many commentators thought that she was evasive in answering my questions about how she came to support federal marriage equality. How that excerpt went viral is something I'm going to briefly revisit with her. Anyway, a lot has happened in Hillary Clinton's life and in the life of our country since the last time we spoke, so let's get to it. Hillary Clinton, welcome to FRESH AIR and thank you for being here in our studio. It is a pleasure to have you here. HILLARY CLINTON: Thank you so much, Terry. I'm delighted to be here. GROSS: So, I want to pick up where we left off. And this isn't going to go in the direction you think it is, so bear with me. GROSS: The last time we talked, an excerpt of our interview went viral. And we'd spent a few minutes earlier on the air talking about how as secretary of state, you were a strong LGBTQ rights advocate, saying gay rights are human rights. Human rights are gay rights. Then after that, I asked you about whether they were gay-related positions, LGBTQ-related positions such as marriage equality that were more difficult to support when you were a senator because you thought the public, the voters weren't ready yet. So this went viral, and the takeaways in the press seemed to be that you were evasive and, in some parts of the press, that you weren't quick enough to endorse marriage equality. I wanted to tell you my takeaway. My questions were a little unclear and unfocused. I think you were a little evasive. But here's my real takeaway. Although a lot of people, including myself, might have assumed that this went viral because of gay rights activists pushing it out, it was the opposite. It actually went viral because of a right-wing website called America Rising. They had it up before we even had it up on our website. And America Rising's goal was to take quotes from the mainstream press and use them against you. So the excerpt of our interview was taken out of context. It no longer had the context of you being a forceful LGBTQ advocate as secretary of state. And really you were definitely going to be stronger on LGBTQ rights than anyone America Rising would likely support for president. So here was the right trying to turn your base against you, the right attacking you from the left. So my question to you is, did you know that America Rising was behind pushing it out and helping it go viral? CLINTON: I didn't know specifically who it was, Terry, but I've had now so much experience in both watching and being the object of a lot of right-wing attacks. And they've gotten increasingly sophisticated. So many times, you don't know where they're coming from. And as I write in my book, they are now aided and abetted by Russia and by other groups that are part of this right-wing ecosystem and echo chamber. So I would not be surprised to hear that about anything that I've said because in the campaign we've just finished, the amount of right-wing attacks, of foreign interference and influence has just exploded. So what used to be kind of a cottage industry by the right is now much more sophisticated, pervasive and in alliance with one of our foreign adversaries. GROSS: Let's get to the present. Losing is always hard. Did it make it especially hard knowing that the person you lost to who is now our president is somebody you've described as a con man with no experience to be president and not the right temperament to be president? CLINTON: It did make it a lot more painful. I have said, look; if I lost to another Republican, I would be disappointed. I would not agree with a lot of their approach toward economics and other important issues. But I wouldn't fear for my country. I believe that Donald Trump poses a clear and present danger to our democracy, to our institutions, to the rule of law, to the civil rights and human rights of so many Americans, to the economic distribution of wealth, which is already skewed out of proportion to where it should be. I tried to say that during the campaign, and I tried to warn people because I actually believed him. I believed that he would follow through. There were lots who said, oh, you know, he never will. He's not going to do all those things he said about building a wall and immigrants and the like. And I thought he was getting so indebted to a minority in our country but a vocal, very determined minority that was going to try to hold him to his campaign promises. And nothing I've seen in the last months ever since he took office has made me feel much better. GROSS: So you were the first woman to be nominated for president by a major American party. And you've said that there are things you felt you couldn't say because you couldn't afford to sound like an angry woman. What's an example of one of those things you would have liked to say but you didn't want to sound like an angry woman? CLINTON: Well, I have an example in the book from the second debate. I was feeling really uneasy, uncomfortable because of the way he was lurking behind me, leering at me, staring at me. I knew that because of what had happened with the "Access Hollywood" tape, he was going to try to change the subject. And I knew that he was going to try to get into my head and knock me off my game. And so I'd practice keeping my composure, and I did. But what if I had turned around and said, you know, you love to intimidate women; you're not going to intimidate me? Back up, you creep, right? GROSS: Well, say you had said that. What would have happened, do you think? CLINTON: Well, I think it would have delighted my supporters. It would have enraged his supporters, and it would have been troubling to a lot of people still trying to make up their mind one way or the other because anger from a woman, at least up until now, is seen as off-putting and somewhat frightening to people. And I knew that. I'd studied all the research. I had lived my life. So in the end, I didn't say anything. I kept my composure, got through the debate. Most everybody said I won it, which is fine. But there were other opportunities that I might have taken to try to more clearly point out the sexism and the misogyny of this man I was running against because clearly he was exhibit A of the remaining problems we have in making sure that women are not treated unfairly and with disrespect. GROSS: Can I play you what I think is one of the more unusual things that Donald Trump said during the campaign? I'd love to hear your take this. GROSS: OK. So this was after - this was in December, and I forget which debate it was after. He was at a rally, and he was saying - he was talking about you showing up late to the debate after a break, that you were late to the podium after a break during the debate. And I want to play you what he said about that. PRESIDENT DONALD TRUMP: I'm watching the debate, and she disappeared. Where did she go? Where did she go? I thought she quit. I thought she gave up. Where did she go? Where did Hillary go? They had to start the debate without her - phase two. What? I know where she went. It's disgusting. I don't want to talk about it. It's too disgusting. Don't say it. It's disgusting. Let's not talk - we want to be very, very straight-up, OK? But I thought that - wasn't that a weird deal? We're ready to start. They were looking - they gave her every benefit of the doubt. GROSS: OK, so that was Donald Trump last December. Hillary Clinton, what did you make of what he was saying? I interpret that as meaning you went to the ladies' room, and that's disgusting. Is that just me, or is that how you interpret it? CLINTON: That's exactly how I interpreted it, Terry. I did go to the ladies' room. And the ladies' room, as I remember, was much further than the men's room. And so it took me longer to get there. And as every woman listening to this interview knows, it took me longer once I was inside. And then it took me longer to get back. And I thought it was a little strange that the TV station carrying the debate went ahead and started. They knew where I went. I mean they have all these people backstage. They knew how far it was because actually my advance people had said, you know, it's going to take her longer if she has to go to the restroom to get there and back. GROSS: That is what people do on breaks. CLINTON: That is what people do. GROSS: Go to the restroom. CLINTON: You go to the restroom if you need to. And I needed to. So look; it was a little surprising to me that they actually started the broadcast again before I got back. They could have done a million different things to give me a few more extra seconds. And it's like the age-old story that you go to a stadium or some other big public place and they claim, well, we've got the same number of restrooms for men and women (laughter). But of course it takes us a little longer. So when I heard him say that, it was in the same frame that he said those horrible things to Megyn Kelly, that he has insulted women his entire life. We have records of it going back decades. GROSS: But what did it mean to you that Donald Trump thought that the idea of you using the ladies' room was disgusting, something, like, he couldn't even think about, absolutely disgusting? What does that - what did that say to you? CLINTON: It said to me that, you know, this is a very emotionally, you know, strange man that that would even, number one, cross his mind and, number two, that he would share it at a rally, that he thought it would endear him or motivate the supporters he had at a rally. Look; I don't pretend to, you know, be a psychiatrist and to try to figure out what goes on in his head. But really, what was that about? He sexualizes women. He objectifies women. He's more than happy to comment on what women look like and whether they're too thin or too fat or whatever his, you know, particular obsession might be. But what about women who use restrooms, which is all of us? What about women who give birth, which is many of us? It said to me, no, I can't be bothered. I can't even think about that. I just want you - I want to see you in a low-cut dress. I want to see you in a bathing suit. I want to see whether you fit my standards. And I thought it was incredibly weird. GROSS: During the campaign, you heard a lot of, lock her up; lock her up. Your reaction the first time you heard people chanting that - when was it, and what do you remember about it? CLINTON: The first time I'm actually aware of hearing it was at their Republican convention. I think it went on before that. I didn't pay a lot of attention to it. I thought, OK, fine, you know, he is whipping up his crowds. He is throwing them red meat, and I'm exhibit A of that. But when they brought it inside to their convention so that it became, in effect, part of the historic record of the general election, I was stunned. I thought, what are they talking about, and why are they - why are they saying this? It was, to me, really not only wrong because obviously there was no basis for it, but it was politics at a very high level being affected by the most dangerous partisan hyperbole. GROSS: This is a question I should probably ask the Secret Service, but I'll ask you. You're the one on the microphone. What implications did all those chants of lock her up have for your security, your personal security? CLINTON: It was a constant challenge for the Secret Service and for what they call threat assessment. It was something that I was aware of. I had a few times people jumping over ropes and rushing the stage and a few really nasty, threatening things said in a crowd. But what really was unhinged were the online attacks. And they weren't just directed at me. They were directed at anyone, particularly women, who went online and said they were supporting me. If they identified themselves as a supporter of mine, they were attacked from both the left and the right. They were often subjected to the most vile Twitter responses, YouTube comments you can imagine. It was just so horrific to see the horrible things that were being said and the threats that were being made - physical threats - to my supporters. GROSS: Let me reintroduce you. If you're just joining us, as you can tell (laughter), my guest is Hillary Clinton. And she has a new memoir, a post-campaign memoir called "What Happened." We'll be right back after a break. This is FRESH AIR. GROSS: This is FRESH AIR. And my guest today is Hillary Clinton. She has a new memoir, as you've probably heard, called "What Happened." It's about her experiences during and just after the campaign. I want to ask you about some of the longtime anti-Clinton people who were affiliated with the Trump campaign. I read Joshua Green's book about Steve Bannon, and he writes, Bannon, Kellyanne Conway and David Bossie were a team of professional anti-Clinton operatives. They'd been plotting to tear her apart for 25 years. And they were all on Trump's team. David Bossie, who was the deputy campaign manager for Trump's campaign - he founded Citizens United which produced the film "Hillary: The Movie" which led to the Citizens United Supreme Court decision that eliminated corporate spending restrictions. And you ran in one of those elections that was so profoundly affected (laughter) by Citizens United. CLINTON: Yes. It was the first time, yes. GROSS: Yeah, OK. And then Kellyanne Conway - she'd been, like, an anti-Bill Clinton pundit when he was president. Her husband helped impeach your husband by drafting the Supreme Court brief on Paula Jones, who sued your husband. Steve Bannon was of course the head of Breitbart News, and it was his idea to get Peter Schweizer to write the book "Clinton Cash," which stoked the controversy over the Clinton Foundation. And that was funded by the Mercer family. So were you expecting that if you ran for president, that the longtime anti-Clinton operatives would be part of your opposing campaign? CLINTON: Well, I knew they would be out there. Whether they were actually in a campaign, which originally they were not - they were backing other candidates besides Trump - I knew that they would still be coming after me. And Terry, I have to say that the Republicans have been afraid of my husband and me for many years. And I think part of it is we don't go away. We don't give up because we understand what's at stake. They fear us in large measure because, you know, my husband was a master politician who came out of the South who understood and had been fighting against a lot of the same bigotry, bias, prejudice, paranoia that has been at work in American politics. When he was a governor, he took on the NRA. He took on race. He stood up against a lot of these forces. And then he did so again when he was president. Bill and I are under no illusions about what we are up against. I sometimes believe that too many other politicians think the game is on the level. You know, you mentioned Citizens United. This was an effort against me which led, because there is a Republican majority in the Supreme Court, to the worst decision, opening up the floodgates for not only unlimited money but undisclosed money. And I was the first presidential candidate on the Democratic side who had to run in that environment. So I view it as a perverse compliment from these really dedicated right-wingers because they know that I know what they're really up to. They want a constitutional convention to rewrite America's constitution to better favor business, to favor religious beliefs, to tear down the wall between church and state. GROSS: OK. But in terms of all the anti-Clinton operatives who ended up being part of the Trump campaign, that's what I think what some Democrats were afraid of when they said the Clintons have too much baggage; we don't want Hillary to run because she brings too much baggage with her. GROSS: That's the - that's part of the baggage they're talking about. CLINTON: Well, but that's all retroactive because before I announced, 82 percent of Democrats said they wanted to see me run, and a very, very large proportion wanted to support me. And part of it is because they know that I will stand up and fight back. I know what happened to our candidates in 2014. Before I ever ran, before I announced that I would run, I was campaigning hard for Democrats in that midterm election. And I saw what the right was doing to really good people, people like Senator Kay Hagan in North Carolina, you know, people like our wonderful candidate Michelle Nunn in Georgia, people who didn't have a history of being lightning rods for the right. That didn't give them any favor. The right wants to defeat all Democrats, all moderate Republicans, all people who believe, as I believe, that we are in a real struggle for the future of America between these very powerful interests. And it was always such a shorthanded, unsatisfactory way for some on the left to say, oh, well, it's all Wall Street. No, this is financial. This is religious. This is partisan. This is something that is very fueled by a desire on the part of big funders of the right to basically have the government do its bidding. And it's not just financial. I mean it is all the other issues, the civil rights and human rights and labor rights and everything that I was trying to defend in this past election. GROSS: My guest is Hillary Clinton. Her new campaign memoir is called "What Happened." After a break, we'll talk about Russian interference in the election. I'm Terry Gross, and this is FRESH AIR. GROSS: This is FRESH AIR. I'm Terry Gross back with Hillary Clinton. Her new campaign memoir is called "What Happened." I want to talk with you about Russia. GROSS: There was never an election like this one with Russian interference. And we continue to find out more just about every day about what the Russians did. It was recently reported that in addition to the hacking of the DNC and John Podesta's email, in addition to creating and pushing out fake news, Russia created fake affinity groups on Facebook which tried to organize anti-immigration rallies, anti-Muslim rallies. What questions do you have about what we don't know about what the Russians did? GROSS: You knew before the election. CLINTON: ...Starting in late spring of 2016, going into the summer. And then we began to pick up clues. Like, for example, we later learned in September that our intelligence community, led by the director of national intelligence Jim Clapper, the director of the CIA John Brennan, had concluded that there was a campaign of disinformation, a cyber campaign against my campaign, against me. And it was meant to discredit me, defeat me if they could and to help Trump. So we were picking up clues all the time. I wasn't - I didn't have access to, you know, all of the secret information. But there was an interesting moment in late-August, early September when Harry Reid wrote a public letter to Jim Comey at the FBI saying, we are hearing a lot. And we later learned it was because Harry had been briefed. And he didn't reference all of the classified material. But he said, we're hearing a lot in the press and elsewhere that there is an investigation going on of Trump and his associates and their involvement with Russia and Russia's involvement with the campaign. Would you verify that? And Comey never would. GROSS: The Podesta emails that they had hacked, the Russians had hacked. CLINTON: Absolutely. They were holding them in my opinion. GROSS: ...To distract from the "Hollywood Access" - the "Access Hollywood" video? CLINTON: Well, from - they may not have known about that specific video, but something was going to happen because Trump was a bit of a loose cannon. And they were going to intervene. And remember; go back to August, and Roger Stone, one of Trump's associates, was tweeting, oh, it's going to be John Podesta's, you know, turn in the barrel and all of that. GROSS: What do you think the press could have done? GROSS: I mean once the information's out there, it's going to be reported on. GROSS: What would have you liked to see the press say? CLINTON: Well, what I would like to have seen is, you know what? These were stolen emails. Every story should start, these were stolen emails, and the best judgment from our intelligence professionals and independent analysts is they were stolen by Russia. And they were stolen for a purpose. And they are clearly meant to kind of, you know, prevent any more attention on Trump's bad behavior and to be like shiny objects all over the place, waving in front of people and to be weaponized - to go back to the point you were making - to be weaponized into negative stories that then can be posted on right-wing sites, can be covered on Russia TV and then can migrate to Fox News and Breitbart and Facebook and everything else. That's exactly what happened. In the last month of the campaign, Trump mentioned WikiLeaks 160 times. Why - because they were making up stuff 24/7. GROSS: You told Susan Page at USA Today that you believe that the Trump campaign colluded with the Russians. What leads you to believe that? CLINTON: Well, I was careful with that. CLINTON: I said, we know they communicated. We know they tried to hide all of the communications, both phone calls and meetings. We know that they took advantage of very well-timed Russian activities. We know that they had a very clear line of communication that was set up, that in fact after the election, the Trump people wanted to continue and not in the, you know, the sight of our intelligence providers. We know that the intelligence community of our country - people who I've worked with, people who I have every bit of confidence in - have concluded that this came from the top of the Kremlin and was intended to help Trump. We know there were all these financial entanglements. We're learning more all the time. I mean there's just communication. There's financial. There's a lot of breadcrumbs and trails that are now being investigated. It's up to the special counsel, the Congress to determine what the facts are. But there is just a lot of smoke there. GROSS: So Democrats have said that they think there was Russian interference in the election but that they're not challenging the results of the election. GROSS: ...About the depth of Russia's interference in the election, do you think at some point that it would be legitimate to challenge the legitimacy of the election? CLINTON: Well, I don't know if there's any legal, constitutional way to do that. I think you can raise questions. In fact I think part of the reason Trump behaves the way he behaves is that he is a walking example of projection. Whatever he's doing and whatever he thinks is happening, he will accuse somebody else of. And there are examples during the campaign when he did just that, like when he called publicly on Russia to hack my personal emails. He knew they were trying to do whatever they could to discredit me with emails, so there's obviously a trail there. But I don't know that in our system we have any means of doing that. But I just wanted to add to the point you made. There's no doubt they influenced the election. We now know more about how they did that and especially how they used Facebook to do that. If I were the president - let me just put it this way. If I had lost the popular vote but won the Electoral College and in my first day as president, the intelligence community came to me and said, the Russians influenced the election, I would have never stood for it. Even though it might have advantaged me, I would have said, we've got to get to the bottom of this. I would have set up an independent commission with subpoena power and everything else. GROSS: So I want to get back to the question, would you completely rule out questioning the legitimacy of this election if we learned that the Russian interference in the election is even deeper than we know now? GROSS: You're not going to rule it out. GROSS: This is totally unprecedented in every way. GROSS: What would be the means to challenge it if you thought it should be challenged? CLINTON: Basically I don't believe there are. There are scholars, academics who have arguments that it would be. But I don't think they're on strong ground. But people are making those arguments. I just don't think we have a mechanism. You know, the Kenya election was just overturned. And really what's interesting about that - it might be - I hope somebody writes about it, Terry. The Kenyan election was also a project of Cambridge Analytica, the data company owned by the Mercer family that was instrumental in the Brexit vote. There's now an investigation going on in the U.K. because of the use of data and the weaponization of information. They were involved in the Trump campaign after he got the nomination. And I think that part of what happened is, you know, Mercer said to Trump, we'll help you, but you have to take Bannon as your campaign chief. You've got to take Kellyanne Conway and these other people who are basically Mercer proteges. And so we know that there was this connection. So what happened in Kenya, which I'm only beginning to delve into, is that the Supreme Court there said, there are so many really unanswered and problematic questions. We're going to throw the election out and redo it. We have no such provision in our country. And usually we don't need it. Now, I do believe we should abolish the Electoral College because (laughter) I was sitting listening to a report on the French election, and the French political analyst said well, you know, in our country, the person with the most votes wins unlike in yours. And I think that's an anachronism. I've said that since 2000. GROSS: If you're just joining us, my guest is Hillary Clinton. She has a new memoir called "What Happened." We'll be right back. This is FRESH AIR. GROSS: This is FRESH AIR. And if you're just joining us, my guest is Hillary Clinton. She has a new memoir about the campaign and her life after the campaign. It's called "What Happened." I want to ask you about, you know, Comey and the email investigation. Comey has said that he felt he needed publicly to say that the FBI was investigating your emails, you know, your email server to protect the credibility of the investigation after your husband spoke with then head of the justice department Loretta Lynch when their planes were on the tarmac together. And your husband went over to her plane and chatted with her. I have no idea what they said. But it raised the question of conflict of interest since she was overseeing the investigation into the emails. So you paid a big price for that chat. We don't know what the outcome of the investigation would have been had it not been for that chat. So in assessing what went wrong with your campaign and with the election results, how much do you trace back to Bill Clinton's conversation with Loretta Lynch? And is that something you talk to him about? CLINTON: You know, Terry, I think it was a phony rationalization by Comey and he - for the following reasons. Both Loretta Lynch and Bill immediately said they talked about grandchildren. There was no subject raised that had any legal significance. That's number one. Number two, there's a chain of command in the Department of Justice. The Deputy Attorney General Sally Yates, who I think people recognize as an incredibly experienced woman with great integrity, was next in line. So there was no reason why Comey could not have gone up the chain, which was what the protocol required. So he could have gone to Sally Yates if he thought, OK, I don't want to put Loretta Lynch in this kind of awkward position. So she recuses herself, so I will go to Sally Yates. But I do give him credit for recognizing there was no case. Where I part company is, when there is no case, that is all that's supposed to be announced. He had to go and do a press conference and indict the entire state department and how the state department diplomats communicate. And I write about this in the book. And I try to be as, you know, dispassionate as possible. OK. So let's say whatever his rationalization was, it ends on July 5 when he makes that, I thought, uncalled for press conference. That's not my beef with him. I mean we were doing fine after that. We had a great convention. I won all three debates. I was, you know, judged by every poll public and private as on my path to winning. Where I part company with him and think he violated every rule in the book as a FBI director was what he did on October 28 because what he did then was to send a letter acting like he was reopening an investigation that had been closed to Congress knowing it would be immediately leaked. And later on when asked, well, weren't you also conducting an investigation into the Trump campaign and their connections with Russia - yes. Well, why didn't you tell the American people that - because it was too close to the election. I think the American people deserve to know there was a - an FBI investigation that had started in early 2016. Americans never knew that. And yet my emails which he re-injected into the campaign at the very end - he could have handled - OK, suppose he legitimately thought - again, from pressure because remember; Rudy Giuliani two days before the 28th said something big is going to happen. He could have said, OK, I want to look at this. I would have said, go ahead. Look at it. I've nothing to hide. Go look at it. It's the same stuff you've already seen. But no, he injected himself, but he never said a word about the Russia investigation. GROSS: ...American democracy and less comfortable where they feel like you're just in it to justify yourself and to say, I should have won; I did really win, and I'm really angry that I didn't. CLINTON: ...All of the mistakes that I made, my campaign made, and I'm happy to acknowledge those because that was part of the, you know, retrospective that I had to go through to write this book. I don't think you can understand what I am most worried about in defending democracy unless you follow along with what happened. And so yes, I do think sexism and misogyny played a role, and it's not just about me. I make that clear. I think voter suppression played a much bigger role than people are acknowledging. That is not going away. I think Comey cost me the election, but it was aided and abetted by Russia, WikiLeaks and all the other things we've now found out about Russia. So take me out of the equation, you know? I'm not running again. I'm not going to be on the ballot. So take me out of the equation, and say, OK, the mistake she made - maybe we can learn from that, et cetera, et cetera. But what do we have to worry about? I think I do a very, you know, clear job of saying, here are the things we need to worry about going forward. And I also try to say, hey, you know, this is something that we all have a stake in. I am fundamentally optimistic about our country, but I am not naive. And I don't think we can change things unless we take it seriously. GROSS: Just getting back for a second to the tarmac thing. Whether or not Comey was justified in his reaction, probably your husband shouldn't have gone onto that plane, right? CLINTON: Well, it - you know what? I don't think either he or Loretta - I mean they never thought about it. It never crossed their mind. They both said that - of course they said in retrospect. For people to blow it up and make all kinds of innuendo out of it, they would never have done it. But you know, they knew each other. Their planes were parked next to each other. They were exchanging pleasantries. I don't think and I don't think my husband ever for a minute thought, oh, my gosh, how's this going to look? It never crossed his mind. And then obviously he and she wished that it hadn't happened because it was used to raise questions that even if they had been legitimate could have been handled in a different way. GROSS: You know, the thing with conflict of interest is it's about the appearance of conflict as much as it is about conflict. CLINTON: Right. But he could have gone to Sally Yates. GROSS: ...Is a conflict in and of itself. CLINTON: He could have said I'm really sorry the attorney general did this, and I don't - I'll take her at her word. Nothing was said. But I ask her to recuse so I can go to the deputy attorney general. And he would have been told, you don't have a press conference when you're saying there's no case. GROSS: My guest is Hillary Clinton. Her new campaign memoir is called "What Happened." We'll be back after a break. This is FRESH AIR. GROSS: This is FRESH AIR. Let's get back to my interview with Hillary Clinton. Her new campaign memoir is called "What Happened." GROSS: You're watching the State Department change dramatically under the Trump administration. What are you seeing that concerns you? CLINTON: Oh, so much, Terry. I mean, there is a misunderstanding at the most profound level about what the foreign service does, what our diplomats do, how well-trained they are, the languages they speak and read, the abilities they have. They're not being utilized. They are not being respected. They are being ignored, and I think it's to the detriment of our country. Take North Korea. You know, we have people who speak the language, who understand the history, who could be extremely helpful in trying to bring about the kind of intensive diplomatic effort that is needed with our allies. Instead, we get the president, you know, tweeting out that he's going after South Korea - makes no sense at all. I could give you many examples that are evidence of their misunderstanding and their disdain for the quality and the experience of people in the State Department. Thankfully, the Congress seems to have a better idea because they did send a budget to slash the Department of State and USAID to the Congress from the Trump administration, and in a bipartisan agreement, they said, no, you don't understand what we know. We've been in Congress. We see what diplomats do. We travel and meet with ambassadors and others who are working in the field. So I'm hoping that the Congress will hold the line on the Department of State and that not as much damage as I feared will actually end up happening to the institution so that it's ready to be used again in the future. GROSS: I think for anybody who is, you know, like, retiring, so to speak, or leaving any job they've had for a long period of time, you go through a bit of an identity crisis. Who am I now, now that I'm not doing this work? So you and your husband are both never going to run again for office. You've said you're out of the game. So you've written this book. You're back in the spotlight again. You're back talking about politics and the election, but that's not going to last forever. You know, the book will come out. It'll be read by the people who read it, and then you're going to go on with your life. Are you undergoing a bit of an identity crisis at all, knowing that there's a big part of your life that's behind you, and you have to invent what the next part is going to be? CLINTON: I'm really not, and that's in large measure because I'm not going to retire from being active in politics. I've started a new group called Onward Together. We are raising money to fund a lot of these new grass-roots groups that have sprung up since the election, to recruit candidates, train them, help them. I'm going to be supporting candidates. I have lots of requests for help already, which I've - obviously have put on the back burner until we get through the book. So I am not leaving politics. I'm going to be involved the way I was before I ever ran for office - the very first time when I was a candidate. So I expect to be really active, and my voice, I'm going to keep out there. (Laughter) I'm not going to, you know, just go slowly and quietly into that good night because I believe - and that's, as you have said earlier in the interview, key to why I wrote this book - I think we are at a very threatening crossroads in our country. And I have said, and I will say it again, I think this administration, and their allies in Congress and their allies on the outside pose a clear and present danger to our nation. So I'm not going to sit by and let - you know, let that happen if I have anything to do with it. GROSS: Have you seen President Trump since he was inaugurated? CLINTON: I only saw him on Inauguration Day. And I write about that and what a surreal experience it was. CLINTON: ...Except the way he tweets at me from time to time. GROSS: Right, and do you read those tweets or do people tell you about them? CLINTON: People tell me about them. And, you know, about this book, he tweeted - the other night, he tweeted, it - you know, it was - you know, inaccurate and all of that stuff. So I tweeted back at him this morning because I have another - I have a children's book that also came out at the same time. It's a children's version of "It Takes A Village." So I tweeted back saying, well, if you didn't like this book, how about reading this one because it, you know, talks about how you solve problems together? So I take it kind of lightheartedly. I never know quite what he's trying to achieve other than feeding his base, which he uses his twit - you know, his Twitter account for. GROSS: Hillary Clinton, thank you so much for talking with us. Thank you. CLINTON: Thank you, Terry. I enjoyed it. Thank you. GROSS: Hillary Clinton, recorded Thursday in the FRESH AIR studio. Her new campaign memoir is called "What Happened." Tomorrow on FRESH AIR, my guest will be E.J. Dionne and Norm Ornstein, authors of the new book "One Nation After Trump." Dionne and Ornstein believe that this subsequent period of national soul-searching could lead to an era of Democratic renewal. I hope you'll join us. (SOUNDBITE OF MARIO ADNET AND ZE NOGUEIRA'S "OUTRA COISA") Transcript provided by NPR, Copyright NPR. Hillary Clinton's final campaign for office ended in a shocking defeat. But she isn't going quietly into the night. "I think the country's at risk, and I'm trying to sound the alarm so more people will at least pay attention," Clinton told NPR. That said, her career as a candidate is over. "I'm done. I'm not running for office," Clinton said. But for those, including Democrats, who would like her to just go away? "Well, they're going to be disappointed," she said.